Spinning but not yet a spinster. 180 degrees.. or about 25% done! 100°? 110°? Well more than 90! Fame (a little bit) goes to my head. Yes, I have been knitting..
One of the reasons I was interested in Sonya's spinning wheel, was last May, I acquired some fleeces. (don't bother to look, I didn't blog about it!) And I have a good hope of acquiring more fleece from the same source next May. 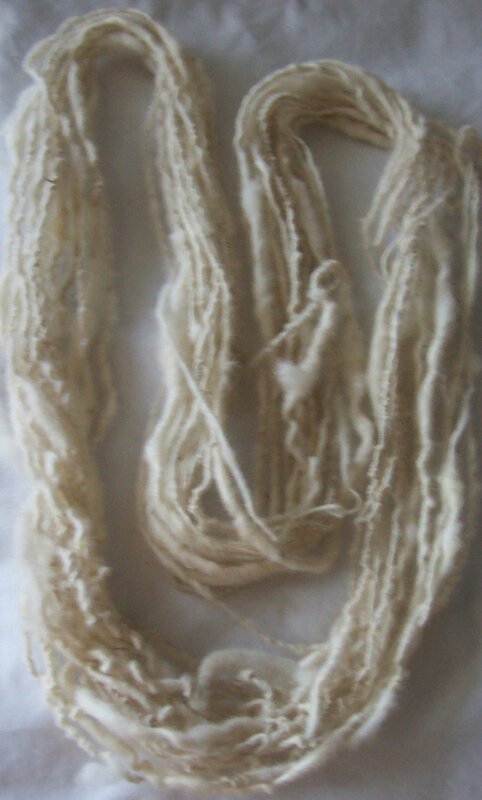 It only made sense with all this free wool around, I would want some way of turning it from raw fleece into spun wool. I proceeded, in the early summer to wash/scour the wool with no directions.. (except—don't agitate, Use lots of detergent, and warm, but not hot water.) 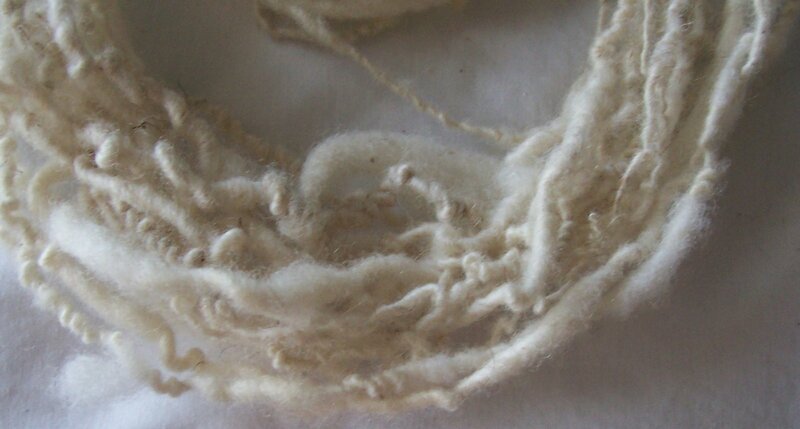 I now know there are things I can do that will result in easier to spin wool--but another spinner reported that she once washed a fleece in a washing machine in a laundromat—so I wasn't obsessive about how I scoured the wool the first time I tried—my bad! In NY State, (both on Long Island and upstate) there are plenty of dairy farms, and there are cows..(I suppose there is an occasional bull, but mostly what you see from a car (going past fields at 60 miles an hour) are she cows. It is udderly clear they are she cows! Same is true for most of New England, and New Jersey, and Pennsylvania. Every once in a while you pass a farm that has a sign, “Angus Cattle” (they are short legged, stocky black cows) and I know Angus is a breed that is used for meat, but in NY State, herds of Angus are herds of cows! Dairy Farmers often have Notices.. “Pure Bred Angus” on this farm,(black cows), “Pure Bred Jersey's”(reddish cows)on an other farm, or “Pure bred Holsteins” (black and white cows) elsewhere, but sheep farms are less common--and “Pure Bred X” (where X is a variety of sheep!!) are even less common! My sheep (possessive aren't I?) are communal sheep. They live a life of leisure, eating grass, apples, (there is an old apple orchard where they live-- and they get to eat all the wind-falls) and sweet hay. 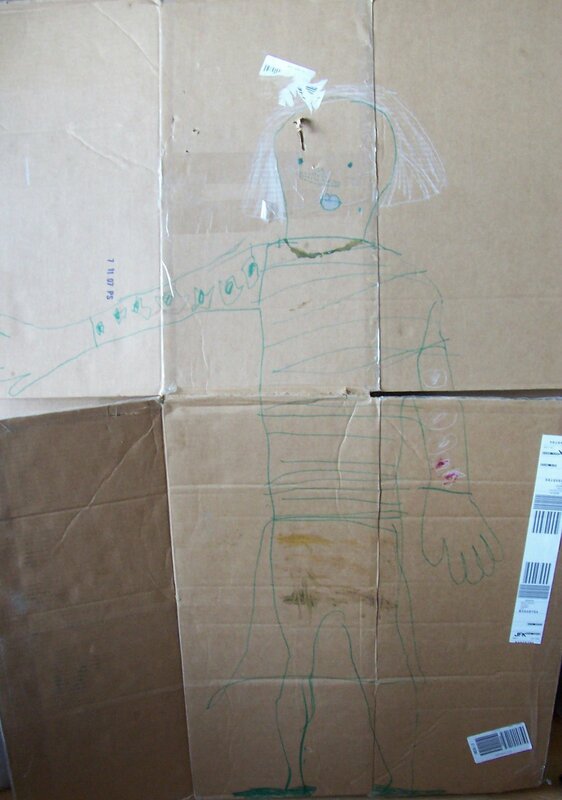 There primary occupation is to entertain children. (Well they might not think so.. they think it's to eat and have fun.) When they die, they die of old age, (not at butchers!). So starting with my home scoured, and simple carded, and not the best wool in the world to work with, my first attempt at spinning is, well not very well spun! Watch not only the draft, but the bobbin. Right now, I've spun all the wool I've carded, and I have to go back and find some good lock of wool, and card them (and clean out the vegetable matter) and try again! Come the new year, I think I'll take a spinning class--and buy some roving. I am sure better materials will help! --Not that practice isn't needed! But I suspect my home carded wool would be challenging for an advanced spinner. In the meanwhile I have 2 more fleeces, that still need to be washed, and combed, and carded and I think I'll follow Yarn Harlot's detailed delicate process for these----I will still be working with an unknown variety of wool, but it will be easier to work with, if I treat it better! Have you contributed to Doctors without Borders (via Yarn Harlot's blog) ? If not, why not? 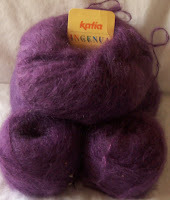 Some lucky winner is going to get 5 skeins of Katia Ingenua.. (750 yards of a mostly mohair blend (78%mohair, 13%nylon, and 9%wool)--but even luckier winners have won even better prizes.. you should go look! Not quite a full circle yet--and more than a full circle will be needed! But perhaps not a full 540° of arc. The short rows are working as I hoped--the stripes remain evident.. They have changed, but the hem edge still has nice wedges of color. Mine is clearly a knock off Inspired by the other... but it is different.I am not documenting the details, but basically, it's a series of short rows, to make wedges of knitting. The spacing of the short rows has changed as the number of stitches have increased, the wedges have changed shape along the way. And at the same time, I am making a series of increases (1 increase at the hem edge every time I complete a short row wedge), with the basic knitting being done in a double garter stitch.. The fabric is soft and loosely knit. I tend to be a process knitter.. I enjoy seeing how patterns, yarns, increases, shaping and all the other details of knitting come together to create a design. I rarely wear shawls--and I wear scarves less often. 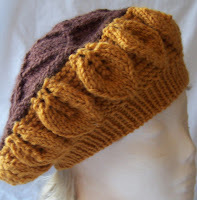 I wear hats even less, but I continue to design and knit them. Socks are about the only thing I both knit and wear! And really, I've only been knitting sock in earnest for the past 5 years!--before that, I didn't know about knitting 2 on 2, and had a very bad cast of second sock syndrome. Besides, she works, and does Art, (I am, at my best, an artisan, more often I am a crafts person) but Sonya is an Artist—And while my son is a pretty good guy (he cooks, he cleans, he does laundry) he also works full time, and the bulk of the daily routine seems to fall on her shoulders! Well, I have the wheel already.. So I have to make an effort and get this scarf/shawl finished in a timely manor! When I haven't blogged in a while, (like now) it's not because I have nothing to blog about.. Rather I have too much..
renting a truck, driving about, and transporting the new (to her) TV. And I haven't blogged about Ravelry, or about meeting other knitters via Ravelry. Nor did I blog about my trip to San Fransisco--This crystal pitcher (above) is a recycled memento of the trip--to visit my son and his family. --and about the philosophy of food.. (natural vs prepared, vegetarian vs ominivorian, traditional vs. new ideas)--food offers a host of blog subjects! I could blog even more about The History of Knitting (not a glowing review) a book I read, and have borrowed--as well as borrowing Nicky Epstein's book Barbie and Me (all the better to knit for my granddaughter)--another subject that is worth a whole blog post! I also skimmed most of Anne Zilboorg's book the Knitting Heretic, much of the book covers things I have previously read about (or by) her, and since our philosophies are very similar, there was little in the book that I disagreed with—or failed to understand. I could blog about Hats--I both skimming the Interweave book on hats, and Anne Zilboorg's book on hats, I feel ready to knit more hats.. and to really get to it, and write my own book about hats! Sonya suggest that I blog more about my life.. In some ways a boring one, but in other ways, a very rich one (if not always a happy one)--but the life and times of neurotic knitter seems to fascinate her! 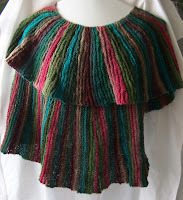 This shawl is sort of like a capelet. The scoop is the neckline is clearly visible. The shape is a C (tilted over and lying on its back) --or half a 'donut' --or half a circle with the center scooped out! Which description works for YOU? Eventually, I'll have a full circle. 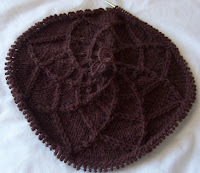 (360°) If I were knitting a caplet, I would stop at a full (or even an almost full) circle. The last half circle will be deeper (longer rows of knitting and longer from neck edge scoop to hem edge) which will UNDER lap this first half circle. So while I have one third (180°) of the wrap done, with each segment of short rows, I am increasing, and getting longer and longer rows, (more stitch =more knitting) and only about one fourth of all the knitting done. Labels: noro wrap shawl, spiral knitting. And more still since the photo was taken.. It's beginning to look like a collar, --and will be worn sort of like a wrap around collar.. I think I am up to at least 140° now. 9 o'clock to 6 o'clock is 90°, to 5 o'clock is another 30°, (120°!) to 4 o'clock, 150°--but.. I am not at 4 o'clock yet.. but I am closer to it now than I was when I took the photo! I hope to be to 3 o'clock before the night is out!.. 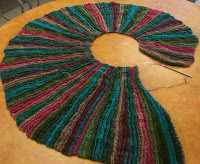 I am looking forward to see how the strip will change the rows of knitting get longer.. I think there will be, because of the short row, some stripping, right up to the end. Then I'll continue round to till I've made a complete counter clock wise revolution --9 to 3 is the front, and 3 to 12, and back to 9 will be the back.. then again from 9 to 3 for the overlap--or rather the underlap! The start (and narrow end) will be on top... the wide end will be underneath. I know I haven't posted anything to my blog for a few days. I've written a few posts, but I –well I've been a sour mood, and the post went beyond acidic to positively vitriolic, and I've elected not to share them--most of them shouldn't see the light of day! I've been knitting-- the Ocean wave socks have a heel (I photographed them when they only had half a heel, but the second half was finished Sunday. And a HUGH ball of an old NORO yarn (a mostly rayon blend) that has been sitting (not put away, but left out, in sight, for inspirations) has finally found a project. The design I'm knitting is a rip off.. a copy of scarf/shawl that has been seen (well seen by me!) in the back of several knitting magazines.... a spiral that starts narrow, increases and turns, making a full circle, and then another half circle (540° in all) --it's as simple as can be, short rows of double garter stitch (K1, P1/P1, K1) with the yarn doing most of the work—and doing a lovely job of it! It's going to be tedious, all those short rows.. (and it will get worse with every inch.. ) already, there are 18 inches of hem for a mere 4 inches of neck (and I am figuring, a loose neck is 18 to 20 inches, + another half neck –27 to 30 inches at neck line (which will be some 100 or more inches of length at the hem end. --I could make the hem end narrower, but I want a soft drapy fabric..and a slightly ruffled edge--Unlike the spiral wrap I've seen photographed in the ads. The truth lies somewhere in between—since the thick parts of the yarn aren't to be found every other inch. This year, I've completed 5. I didn't finish a single pair of socks from January to July! 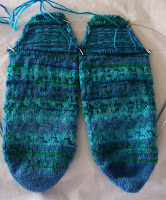 So far, this year, there have been the Koigu socks (6months in the making! ), the Autumnal socks, the Blues, (overdyed Lion Brand yarn), and the Faggoted Ribs socks. 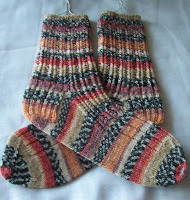 Just finished are ho hum generic socks in a self striping yarn. Knit top down --with a Channel Island cast on, an after-thought heel (a banded heel) and banded toe. Nothing wrong with them, but they just don't 'sing'. The self striping pattern is almost perfectly matched, but the socks are just –socks. Last night-- I started a new pair of socks.. they are flying off my needles.. I love them—the toe is long (almost 2 inches), and another 2 inches beyond that have been knit! The yarn is left over Kroy sock yarn.. an incomplete ball of a medium blue, another incomplete (but less so!) of the bright blue, and the third yarn is the same bright blue that I experimented with and overdyed—in a sort of hand painted colorway. The colors move from royal blue, to bright blue, to blue green to emerald green. They are toe up, with a magic cast on, and lifted increases. On the top (instep) the pattern is one often called 'hook' but I always see it as waves.. so these are my ocean waves sock! 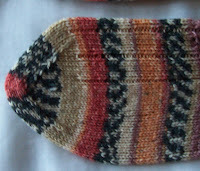 The sole of the sock is worked in a simple 3/1 pattern that doesn't have a name. I like this turkish style –with different patterns for the instep and sole for socks.. .
At the same time, I have an other version of the Ruffle scarf (Amanda Brown's pattern from Scarf Style working in 2 shades of Mode Dea Bamboo wool (celery and moss green) The Ruffle scarf is pretty, but with all the short row, its slow going! (and opening up, organizing, photographing, uploading and then packing away my stash--all this done for ravelry!-- is also eating up a good deal of my time! 80 plus entries in my ravelry stash, and I am still working on the wools!--still to come are cottons, and other fibers, cones, and mohairs and, of course, sock yarn! Do I need to say this? Stocking knit curls! It is the nature of the stitch. It's not a fault. It's not a feature. It just is. Accept it. Stocking knit will curl both lengthwise and widthwise--a conflict will sometimes keep the corners a bit flatter.. but stocking knit curls. I could go into the science, but she did, and she did, and so did she --and so did many others.. a google search of “Why Stockinette curls” yields 20,000 + hits! If you want to better understand knitting, and the nature of stocking knit, you can read and understand why it curls. Or you could just accept the fact that it is the nature of stocking knit to curl. This curling nature make stocking knit sweaters (held flat by seam) drape and conform to the human body. It makes socks and other items knit in the round (tubular knitting) fit well too. You can fight it— But you'll lose. 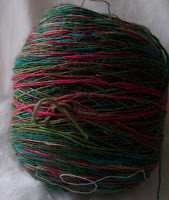 Several recent threads on different BB's have knitters saying “I know stocking knit curls, but.. It doesn't seem to in this photograph --but when I try to knit the same thing, the stocking knit curls!? It can be blocked away, right? --Even thought I am knitting with an synthetic fiber that can't be steam blocked. What if I add a twisted stitch or a few garter stitches, or something else at the edge? It won't curl if i knit it loose enough, right? Forget it! Stocking knit curls! Accept the nature of the stitch, and live with it. 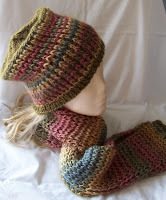 You can knit the scarf in the round, or knit it flat and seam, or double knit it. 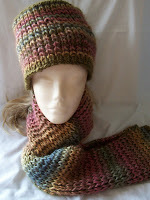 If you don't want a double layer scarf, use a stitch pattern that has a balance between knits and purls. Ribbing is one, garter stitch is another –but there are many options besides these two! Waffle, Flag, basket weave, any stitch dictionary or collection or treasury is going to have dozens of stitch patterns that balance knits and purls and lies flat. And many of these patterns have the virtue of being identical on each side--some are different, but equally attractive. Once you realize that the curl of stocking knits stitch is the nature of the stitch, it's a quick and easy step to begin to seeing the Curl as a FEATURE. A feature you can work with instead of a flaw that needs to be fought. Soon after that, you'll be thinking about how to make use of this feature! There are some techniques that USE the very nature of stocking knit to curl-- Some designs and designers that cleverly use the nature of stocking knit to curl to their advantage. The nature of the stitch hasn't changed. It is just being worked with—good design allows stocking knits nature to curl to work for the design, instead of against it. Look at the lovely curled edges of the ruffle.. Remember stocking knit curls-- See how it accentuates the ruffle, softens it, and gives it depth! Look at the lovely curled edges on this sweater neck or on the brim of this hat... in both cases the curling nature of stocking knit is USED to soften the edges. Here is an other example.. the nature of stocking knit to curl created deep ridges, and make the color changes more dramatic. Stocking Knit Curls—how cool is that? Like many people, I am a mass of conflicting ideas. I have to constantly work on ridding myself of prejudices I have acquired over the years. I recognize that I am a bit afraid of my own creativity, and self censor. Last time I posted about my 15 minutes of fame. And since then, I have found further excitement by discovering that 2 people (well, at least 2 people!) have found my blog, and the free patterns I have posted, KNIT them, and –(incredible, unreasonable pride here) posted them in the Ravelry Pattern Library! LaniW doesn't have a blog, but Sherilyn does. 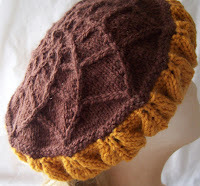 You can see her other projects, (if you are not yet a Ravelry member) here. --and let my desire for fame to sink to nothingness, but I am, sometimes, as much of a failure at it as Augustine was--when he prayed for patience.. NOW! I'm in Ravelry now a month –and while I've added some projects, and some photo's, I still haven't begun to add stash –and I don't know that I'll ever add anything to my queue. I often see things that I might want to knit, but like the recent Swirl Sweater, there is often a long gap between seeing and knitting. Way too often, no matter what I think my plans are, I get distracted. How would that look in a different yarn? Or in a different color? Sometimes, the swatch remains a swatch.. But this week, the newest swatch became something else! The stitch was interesting enough in the scarf... And worked just as nicely in the matching hat. Now I want to see it in different colors.. Brighter, darker, with the relative color values reversed. How would this stitch look with a solid foreground and color stripes as a background? I might end up playing with this for a while... and getting a few rows of my socks done in the off hours. Speaking of socks--I wonder how it would work for socks? The result would certainly be a warm sock! 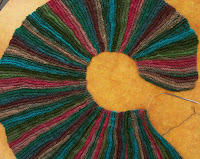 Finally, getting back to Ravelry, for the moment (i.e., my 15 minutes of fame) the editors have chosen my image of the Phyllotaxis scarf (see it here if you aren't yet part of Ravelry) to illustrate the data base entry on this pattern. On and off in the past few weeks, I've been swatching. I have many stitch collections, and I still haven't knit them all. And really you don't know what a stitch really looks like till you've knit it up in the yarn you intend to use it for. I had some fine, fine silk and cotton, and was thinking about what to do with it.. and a sampler of stitches swatch sort of evolved--the plan was for a diagonally shaped scarf, so the swatch is shaped the same. I tried the simple, tried and true, stocking knit with beading..
along the way I made an mistake--(can you see the 'wrong' row in the center of the image?) and decided I like the mistake so much I'd repeat it for a few rows and see how it looked. I loved the look—but realize, there was no way I was going to work this fine, fine silk in this stitch. The stitch was interesting, but not for this project. Slip stitches have compressed rows.. (more row to an inch than say stocking knit) I put the swatch aside. But I like the stitch, and thought about how it would look in a stripe. 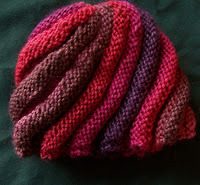 Slip stitches often change dramatically when striped--So, another swatch, in a different yarn, striped. Remember, I was looking for an interesting, textured purl stitch. After a dozen rows of my new swatch, I thought about swapping the relative positions of my yarns. 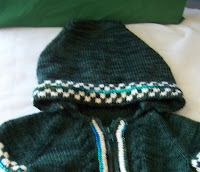 The purl side was predominately green (the solid colored stripe), and the colored stripe, was too under- expressed. There wasn't enough color there. But look at the wrong side! Every other row of this slip stitch pattern is 1X1 ribbing.. and the wrong side does sort of looked ribbed.. but the green row of ribbing is so compressed, it hardly visible. The uneven tension creates waves—And what is not visible is how thick and plush the knitting is. This is definitely a cold weather scarf. It's like a thermal blanket.. Not tightly knit, but dense, with lots of air-trapping spaces. It's not what I expected, or even what I wanted, but I like what I got! And this swatch is going long. And like most sweaters, it won't look its best till Cyrus tries it on.. The headthingy is, I think about the right size, (and the hood looks to be a bit big) but the headthingy has a longer neck than the average 2 year old—so the shoulders are all wrong. Oh--it hasn't been blocked! but it looks good enough.. I am still thinking of adding some ties for the hood. (I think I'll cheat.. I'll make ties, and Sonya can and them if she thinks they are needed. I should take some inside pictures too, and show off the hems and interior zipper bands--even the cables are reversible. so the sweater looks good open and flapping. My son is rather like me, (and is happier with cooler weather rather than warmer) and I think Cyrus follows suit. Enough here to keep a kid warm, (and a mom happy) with out being too much clothing to interfere with having fun. The hood is shaped like a giant short row sock heel and about half done. It will lie flat (I hope!) when not on—like a large shawl collar. The edge will be finished with the same checkerboard motif on hems. I think I am going to add some hidden buttons to help hold the finished edge of the hood neat against the neck line edge. I have been finishing (weaving in tails, etc) as I go, so the sweater is closer to completions than it other wise might be. Cyrus's sweater needs to be sewn and steeked, zipper plackets (and zipper) and hood still need to be added.. But the body is done--granted, hood is almost an equal amount of knitting, so it can only fairly be called half done—but there are some nice details already, hems of checkerboard. The checkerboard detail will be added to the hood too. It retails for $5.95 –at places like A.C. Moore, but who pays full price? There are once a month moonlight madness sales with 25 to 30% off all purchases, and 40% off coupons (go once a day for a week) or just sales. 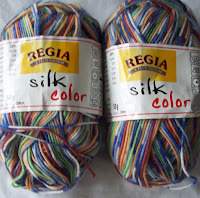 At $4 or less a skein, it's a value yarn.. too bad there is such a limited range of colors available. Red, blue, raspberry, green, charcoal where the only shade available at my ACM--the colors are very attractive shades.. The blue, on close inspections, has shades of red, and navy, and a depth of color that is remarkable. But there are not light shades, only one shade of grey (dark) no white, cream, tan or browns.. And it is possible to do pastels blues, greens and even pinks that don't scream “baby”--but none of these colors are available! And then there is Ravelry.. I haven't really made a dent in adding projects or stash, or all the other features.. and it still eats up time. I've added about 50% of my library.. but many of the knitting books I own aren't in the DataBase yet. But it take time to discover that. Finally, stealing a good idea from, Jennifer Dickinson, I've been working on a NYC/LI LYS spread sheet.. This is a google document, (read only) every time I think I have finished it, I discover an other half dozen LYS! Still with almost 70 entries, its a good place to start if you are looking for a local yarn store in NYC area (eventually, I'll add the Westchester county stores as well.. but I draw the line a NY--Some one else can do NJ and Conn.. There has also been some mending and cleaning, and there are sewing projects awaiting my time—and a new one.. Have you seen Grossman's Gams? The Tsock Tsarina has once again done the remarkable! ACH! It's been 15 day since I've posted.. I could recount all that has been going on.. but..
Do you know the expression, if you say A, you must say B, and if you say B, you must say.. Most of the alphabetic litany would be boring.. Most of the litany would be along this dull boring vein. Let's skip to K-- there has been some knitting. 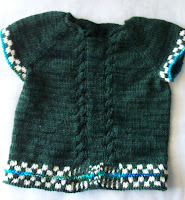 Cyrus's sweater was put done momentarily--- it is back in the cycle as of today. Then decide on how many stitches you want to decrease—or as I did, how many stitches you want to end with-- in my case, I settled on 10 stitches remaining on each side—at the tip of the toe. 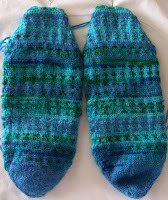 So, starting on one edge of insole, Knit 9, K2tog, (place marker) K8, place marker, SSK, knit 9 --Repeat on sole. Follow this pattern (decreasing every other round), until all the side stitches have be decreased, then kitchener remaining stitches--in my case, the 10 remaining center stitches. Since I knit my socks on 2 circs, and all the instep (and all the sole) stitches are each all on 1 circ, and it's very easy.. but its not hard to do with DPN's, --since generally stitches are organized with all of the sole of sock on 1 or 2 DPN's, and the instep on the on the other DPN's. This results in a center group of stitches, and two slanting sides. The end result is toe shaped very similar to the more common flat/french toe... but--just a bit different. This is worked on DMC #5 pearl cotton with 24 gm of 6/0 seed beads --mine in a color mix called moonstone, with light grey pearl cotton. But you can choice any color combo that suits your fancy--the choice of color of the pearl cotton and seed beads is entirely up to you. The entire thing is worked in i-cord. Thread all of the beads onto pearl cotton (the nail polish stiffened end can be used instead of threading a needle)the single strand of cotton will easily slip through the beads. Work all R's in I-cord. R1: K2, **bring yarn forward, (as if to purl) slide 1 bead up to last stitch knit, Slip the next stitch on needle, then bring yarn back* (as if to knit.) K2. R3: K1, Bead stitch, K2, Bead Stitch. Repeat R's 1 to 3 until all beads have been worked –or till you have reached desired length. Work 5 R's plain I-cord. Work 4 rounds of 3 stitch I-cord. Work 1 round, then bind off. Finish by adding jewelry hardware, or knot tails together with a square knot, and weave tails in. A drop of white glue (a very small drop!) will secure knot and keep it from undoing. A 24gm tube of beads will yield about 20 to 21 inches of beaded I-cord.--with the unbeaded beginning and ending rows/rounds, this will will result in 24 inch (or so) finished necklace. To make a shorter necklace, work fewer rows of plain I-cord, or fewer rows of Beaded I-cord. PS--if you haven't done so yet, be sure to link to KnitSonya--she has posted a lovely set of photo's of Miss B modeling her Swirl sweater.